School days are always nostalgic memories of the past which I sometimes feel to rewind the cycle and get back to school uniforms again. Gone are the stress free days, but those are the days days when studies took the most stressful part and every child wishes to grow older soon to earn a living soon so that he/she can put away the books. Little do they know about the world that welcomes us after the school age. My kids also wish the same and I keep telling them that now is the best part of their age where you have enough time for play,studies or friends. My school days was always surrounded with many north Indian friends, who those days were crazy about idlis and dosas.The only access for north Indian friends to devour idlis or dosas was the lunch box that their south Indian friends brought to school. I had one of my good mallu friend, who never got idlis to eat for lunch whenever she bought to school as her mom always packed the idlis with gun powder(chammanthi podi) which was their favorite combo. Many of us were also in the same shoes and poor girls had to rely on canteen stuff to fill up their tummies. There were times when we used to carry two lunch boxes esp on a idli or dosa day,one for friends and one for self. Such was the craze of idlis and dosas during school days. Now things have changed, restaurants /dosa huts are an easy option for people who don't make idlis/dosas at home. Also, the idli /dosa batter is also readily available in super markets and Indian stores. Anyways, I have always enjoyed my mom's handmade idlis/ dosas made by grinding rice and urad dal. Eventually I followed the same steps and made my own version of idlis and dosas. 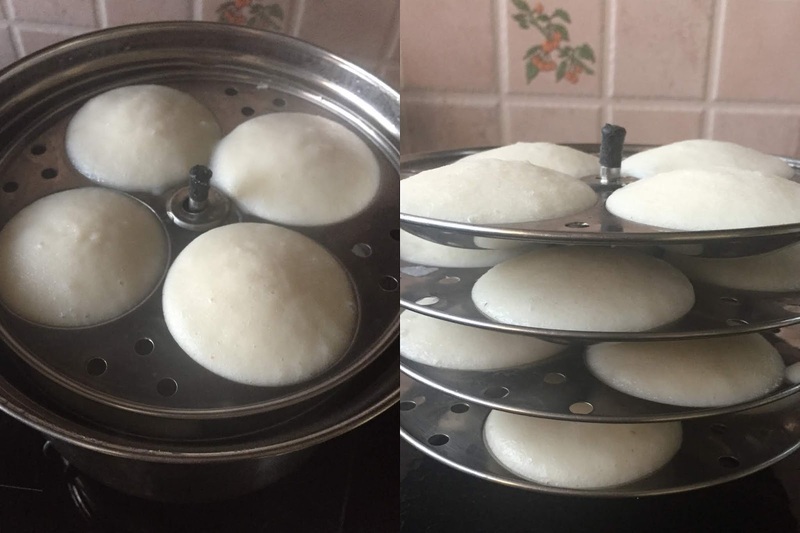 The idlis weren't always soft and perfect in my initial days after marriage but gradually I have gained confidence in making them in a mixer and have hardly felt the need of a grinder. Many who have tasted the idlis at my home have been asking if I use grinder to make the spongy soft idlis and the ratio of rice and urad dal etc. 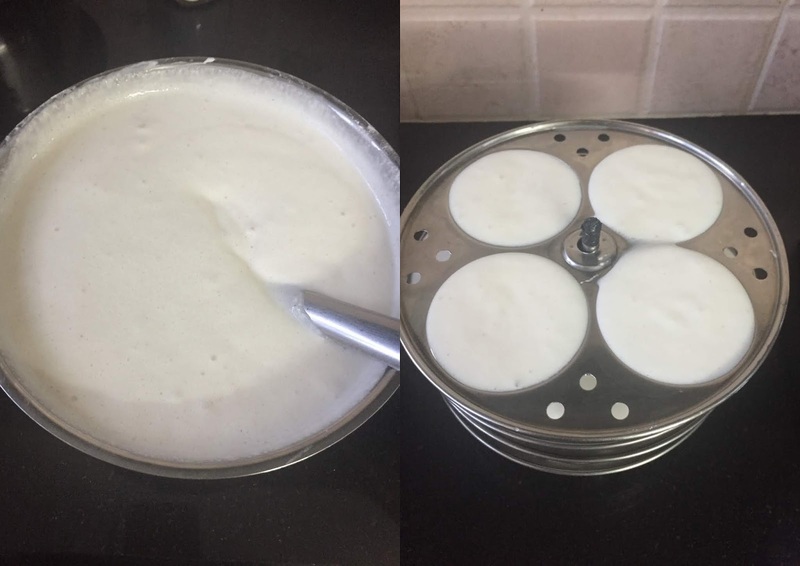 Even request from one or two good readers who have asked to post this recipe too and I was always lazy to write such an elaborate post and kept postponing.Though the recipe has nothing out of the blue moon but a few tricks and tips that I follow gets me to softer idlis I suppose. I have even started trying out different idlis with barley and quinoa,check out quinoa idlis and barley- oats idlis if interested. 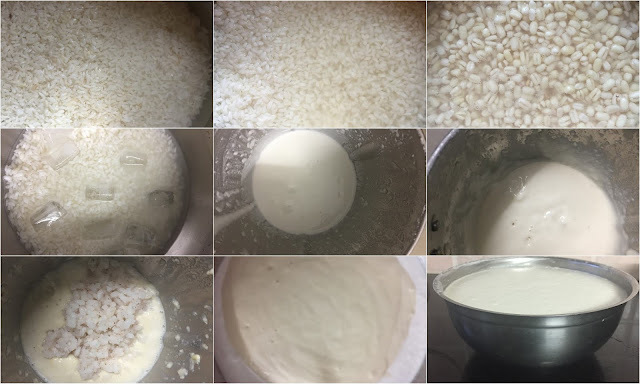 One thing for sure is in a grinder,the rice to urad dal(uzhunnu) ratio is very different and is almost 5:1 where as in a blender or mixer the ratio of rice to urad dal is 3:1 or 2:1.The batter for idli and dosa is no different but there are slight changes too. When grinding for dosas, its better to grind with few spoon of aval than cooked rice,that way the dosas gets brown and crispier. Wash and soak the rice and urad dal. Use the soaked water to grind too as the soaked water has starch in it so don't discard this water. Separately soak each of the dal and rice. Don't run the mixer for too long such that the jar gets heated up. Add ice cubes as and when necessary to maintain temperature. Use iron griddle to make spongy dosas like set dosas. Non stick dosas don't give that taste and flavor. Gingelly oil helps in easy removal of dosas from griddle and adds a color,flavor to dosas. Use cooked rice or fenugreek seeds when grinding for idlis. And grind aval/beaten rice when grinding for dosas,yields crispy dosas. Preferably use good quality steel containers or glass containers with a tight lid to ferment the batter. Its better to avoid plastic containers as the fermented product may react with plastics. How do I prepare the batter? Wash and soak the plain rice,idly rice, urad dal(uzhunnu) separately in different bowls in enough water(water just above the rice for 3-4 hours and for urad dal(uzhunnu) slightly more than that as it soaks up more water) for about 4-5 hours. After 4-5 hours, transfer the plain rice to the mixer. Add as per the holding capacity of the jar. Add in few *ice cubes and water slightly. Pulse the mixer twice and check the water level. Add more water if required(remember that ice cubes turn to water so add water accordingly). Run the mixer and grind until smooth. Transfer the batter to a large bowl. Similarly grind the idly rice and then urad dal(grind each one of this separately as each of the rice and urad dal takes separate time to grind). Add less water while grinding urad dal. Also remember to add the cooked rice (or soaked aval) in the last batch of grinding urad dal. You should see air bubbles on top of the batter once the aerating procedure is done. Cover and leave to ferment in a warm place for 7-8 hours. In the morning or after 7-8 hours, add salt to taste and mix the batter well. Heat water in an idli maker or idli cooker and keep for boiling on medium flame. Grease the idli mould with gingelly oil or coconut oil(I use coconut oil). Then pour in batter from the lowest rack to the highest. Pour about 3/4 th full in each mould. Place the next mould tray on top and repeat till you finish. Place this trays in the cooker and steam cook for 10-12 minutes or if you have an apprehension check using a tooth pick inserted in the center of one of the idlis.If the tooth pick comes out clean,then its done. Remove from the cooker and leave to cool slightly for 5-6 minutes until the idlis leave out from the sides of the mould. Using a large shallow spoon,scoop out the idlis and place it in a casserole. Keep covered. 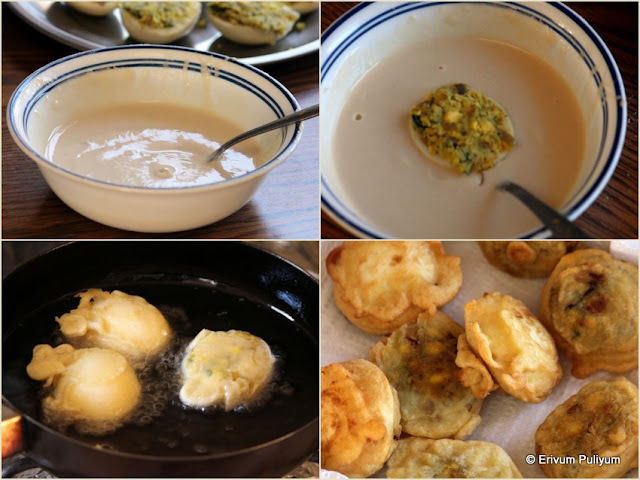 Repeat the same steps till you finish all the batter. If you wish to refrigerate the remaining batter,then transfer this in an air tight container and refrigerate in the first row of the fridge. Serve the idlis with sambar/ tomato chutney / coconut chutney(few more sides listed below). Enjoy! The basic principles remain the same for grinding for dosas like idlis. If you plan to make set dosas or spongy dosas then make the batter slightly thinner than idli batter. If you plan to make ghee roast or nei roast or paper dosas, then make the batter watery. Add water only after fermentation. Heat the iron griddle or dosa stone(dosa kallu),apply some gingelly oil/ghee using a soft cloth or a peeled shallot poked on a knife tip. I use a soft cloth and gingelly oil. As soon as you see steam seeping through the stone or griddle, pour one ladle full of batter and spread immediately starting from the center to the outside. Wait till the bubbles surface on top of the batter and break open. Reduce the flame then to low and sprinkle few drops of oil on top(optional),flip to the other side. Cook another 45 seconds and remove on a plate(the iron gridlle dosen't get over heated for the next dosa this way if you reduce the flame at this point. Increase flame again, smear oil or ghee and then pour batter,repeat the same steps to make dosas with remaining batter. If at any point if you feel the iron griddle is over heated, then sprinkle few drops of water and wipe the griddle,reduces temperature of the griddle. Then smear oil and pour batter,works good. Otherwise the batter doesn't spread easily on an over heated griddle. I usually don't make and store dosas like idlis in a casserole as dosas turn soggy very soon or becomes hard if left outside. Make hot dosas and serve immediately with sambar/ coconut chutney/ tomato chutney (few more sides listed below). If you happen to grind the batter early like 5 or 6 pm and leave to ferment till morning,it may go over fermented and turn sour. In that case,I generally refrigerate the batter till 9 pm and then remove it out from fridge. Mix well and leave out to ferment thereafter. There should also be enough space in the container for the fermentation. Leave a 2/3 rd space empty so that there is enough space. I usually grind for two days and keep one portion of the batter without fermentation in the fridge. The day before I plan to make idlis/dosas,just keep the batter out from fridge. Mix this nicely to aerate and leave to ferment 7-8 hours. Works good. During winters in US, I used to leave the oven light 'on' and keep the batter in for fermentation or preheat oven for 10 mins and then switch off oven. Place the batter in after 15 minutes. Another good trick is to place the batter in a container that can fit easily in a Indian type casserole or hot case. Keep the container with batter in the casserole and cover with a lid. This is what I follow now during rainy days. Anyways,these are all few ways that you can adapt or find newer styles. The ultimate aim is to provide good warm atmosphere for the batter to ferment. Add salt once the batter is fermented without disturbing the air bubbles much. I feel adding salt after fermentation gets the batter fermenting well than adding and leaving to ferment. Anyways that's each one's individual choice. * Mom makes idlis with plain rice(raw rice /kola rice /pachari) alone,you can always try that without adding idly rice but I feel over the time, the idlis made with idli rice combination are more spongier compared to the ones made with raw rice(kolam rice/pachari) alone. I used to make that way to but in that case its better to add more uzhunnu or urad dal, then only the idlis comes out softer like this version. * Adding plain rice 1 1/4 cups and 3/4 cup of idly rice also yields soft idlis. If you are comfortable in that ratio then go for it. * Ice cubes help prevent the batter getting over heated and that way the batter doesn't ferment well. Mixer always has a tendency of getting heated and so the contents in it. * You can add fenugreek seeds (1 tsp) instead of cooked rice. Though the idlis come out very soft but there are chances of batter getting sour if we ferment for 6-7 hours as the batter with fenugreek ferments faster than the batter without fenugreek.The color of idlis is also off white and so I hardly use fenugreek. * Aerating the batter with hand gives the batter a lighter feel and ferments better. * Use an iron griddle to make dosas which gives a nice crispy and browner side. Non stick dosas turn hard soon as it cools down though it uses very less oil. Instant hot dosas on non sticks come out good and if served hot,turns good too but once it cooled the dosas turn hard. Rainy season always demands something spicy and chatpata to savour especially garam pakoras(hot fritters). And today's post is a pakora made with eggs and tastes delicious with the masala filling in it. 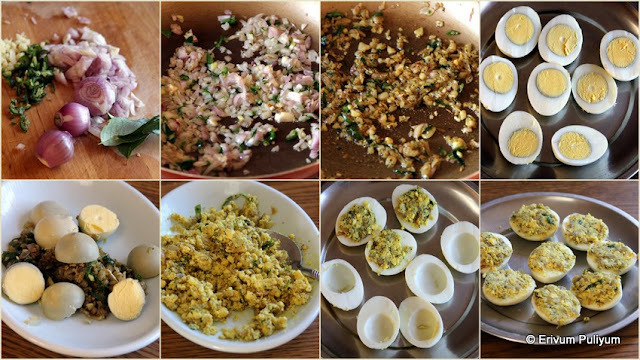 This is a Malabar egg snack and can be prepared for Iftar during Ramadan or even as a protein packed evening snack for kids. This post doesn't need any expert hands to try on and so can be tried anytime. Try this simple tea time snack that you can prepare with hard boiled eggs in very less time and kids will surely enjoy these. They taste delicious with the masala filling and outer crispy covers. Serve it hot else it becomes soggy. The spicy green chutney goes well with this snack more than ketchups. Hard boil the eggs with enough water and salt for 7-10 minutes. Drain the water and add cold water to the eggs,leave for 3 minutes. Then peel the skin off,clean under running water to remove any struck egg shell. Cut in halves,separate the egg yolks and egg white,keep aside. Heat a pan,add 2tsp oil and add the finely chopped ingredients listed above. Saute until slightly wilted and browned. Add in the spice powders on low flame and saute. Switch off flame,remove this mix in a plate and add the egg yolks to this mix.Crumble the egg yolks and mix with the onion mix. Fill this mix in the egg whites,keep aside. Make a batter using maida and rice flour,add salt and water. Make a thick batter to coat the eggs. Heat a kadai with atleast 2" deep oil(if deep frying). I opted to shallow fry, which takes slightly longer to evenly brown the sides than deep fry.Wait till the oil gets heated. Now dip each prepared egg in the prepared batter. Using a spoon,transfer this to the kadai. Let the bajji get cooked well,flip both sides till its lightly browned. You can add as many as the space of kadai permits in one batch. Don't over crowd the wok/kadai. Repeat the same steps till you finish making all. Serve warm with tomato ketchup or any spicy chutney. * I feel a pinch of turmeric powder to the batter would have added color to the cover. * Alter or increase spices as per your tolerance. Life is not a bed of roses always. Each one of our lives take good turns and bad turns as we progress. And I believe that the person who undergoes through the good, bad and tough times has only lived a good life. They understand all emotions,struggles and can raise good children too. Nowadays, kids hardly have any stress tolerance and emotional control. We read such untoward incidents daily in the newspapers these days. Anyways,not boring you all much with my thoughts but all I wanted to equate this to our tummy and taste buds. They are also designed to taste all flavors, Isn't it? And so how about tasting some bitter gourd today, I know very less will nod a 'yes' to this veggie. I feel we should practice to put our taste buds to taste all flavors. Personally am an adherent fan of this veggie and so is my better half. Hence I make sure to buy this veggie whenever I get hold of the fresh ones. Kids like the pavakka mezhukuparetti or bittergourd stir fry as the bitterness is reduced slightly than the stir fry as it is fried in oil. This stir fry is made with grated coconut which brings down the bitterness considerably. Also mixing it with salt, keeping aside for sometime and squeezing out the water drained out and throwing the water reduces the bitterness. If you are using the dark green variety then should definitely drain the water as its very much bitter. Its better to select the light green variety which is mild in bitterness. This thoran tastes yumm with steamed rice with a side of thakkali curry. Try out this combination,am sure you will change your way of thinking about this veggie!! Wash the bitter gourd(pavakka) under running water and slit vertically, scoop out the flesh(the white portion inside as much as you can as that's the most bitter part along with seeds). Chop it in small bites and mix with a little salt. Keep aside for 5-7 mins and squeeze out the water that is drained out(helps reduce the bitterness). This is an optional step if you would like to reduce the bitterness or else just proceed further. In the meantime, coarsely grind/pulse the coconut,shallots and *green chillies without adding any water.Don't over do this or else the shreds become very small, just a pulse or two is enough. Heat oil in a pan and add mustard seeds when oil is hot. When the mustard splutters, add the turmeric powder on low flame. Add the chopped bitter gourd, onion, curry leaves and the coarsely ground mix(if using cut green chillies, add at this point). Give a quick stir and add few splashes of water. Cook covered on low medium flame for 3-4 minutes. Uncover lid, add salt as needed and cook covered again for 2-3 mins. Switch off flame once all the moisture is evaporated. Taste test salt if needed. Enjoy with steamed rice !! * Make sure to select the light green variety of bitter gourd for this stir fry. The darker the bitter gourd the bitterness is increased. I have used the dark green bitter gourd here. * The green chillies used for the thoran(stir fry) and can be crushed along with the coconut. I have added as sliced in this thoran. * You can even add 1/2 tsp tamarind extract too to reduce the bitterness. But I don't like tangy flavors in stir fry so haven't added. Chakka cake is yet another delicious chakka recipe that you will not regret trying this out. I had no clues of trying a chakka cake. I bought in some cooked jackfruit pulp mixed with jaggery when I went home to make chakka varetti. But then the baker in me woke up and I decided to bake a cake with a small portion of the pulp and make chakka varetti /chakka kumbilappam with the rest. Had my confusions,whether this will taste good or not. Placed it in the oven and waited patiently,finger crossed. Believe me,the house smelled so good that we couldn't resist to taste the cake. The cake is super soft and delicious. This tastes and looks similar to the banana cake. The first batch just finished in no time and I had to bake again the second time for kids. Then the third time I decided to click pictures, and carry a cake for my parents when I went home. They were so happy to taste the cake and my mom kept saying that it was a spongy and delicious cake with chakka(jackfruit). If you are a banana cake lover then you will definitely love this texture of the cake. This is a spiced cake with cinnamon,cloves and dry ginger and there is a mild tinge of jackfruit in this cake. The cake is spongy soft and delicious. I wanted to try the cake with cooked jackfruit alone without the addition of jaggery but unfortunately the season of jackfruit is come to an end I suppose. Anyways next time,will give that a try and update the pictures too. Till that time enjoy making this or try with the cooked pulp and let me know the outcome too. I had no clues of making this cake so referred my pumpkin cupcakes recipe and banana cake recipe,and baked this up. But am happy that the cake turned out so good. Am sure you will enjoy too,try this out(Remember to go through the notes section before starting) ! Sift the flour with baking powder,baking soda and salt twice. Prepare a 8" round tray,line the bottom with parchment paper and sides with butter,dust with flour. Keep aside. Powder the sugar with cinnamon,cloves ,and dry ginger (Use 3/4 crystal sugar for getting 1 cup powdered sugar). Pre heat oven to 350 degrees C or 170 degrees F.
In a bowl, add the room temperature butter. Beat the butter until soft and pale. Add in the powdered sugar mix and beat again until light and fluffy. Separate the yolks and white from egg. Add the yolk to the butter sugar mix and beat again. Add in the vanilla extract. Now, toss in the flour mix little by little to combine well using a spatula. Beat the egg whites separately and mix gently with the batter without deflating the air much. You may not need to add any milk but if in case required add 2tbsp milk to adjust consistency. Finally toss in the chopped almonds,give a quick stir. Add in the sliced almonds on the top. Transfer the batter to the prepared tray,tap the tray on the kitchen counter to release trapped air. place in the preheated oven and bake for 35-37 minutes or until the tooth pick inserted in the center of the cake comes out clean. Remove the cake from oven once done and cool the cake on wire rack completely. Cut in pieces and serve. * I have used unsalted butter,if you are using salted butter then skip adding the salt in the flour. * Adding chopped almonds is optional,gives a nice crunch in the cake. * I have used cooked jackfruit pulp that was mixed with jaggery. That's the reason the pulp has a brown color. But when you try just clean and deseed the jackfruit. Cut the jackfruit in small pieces and cook the jackfruit in a cooker. Add half cup water and cook for three whistles.Cool the cooked jackfruit and puree the jackfruit in a blender without adding any water. There is no need to add jaggery. * One cup powdered sugar is ideal for making this cake. 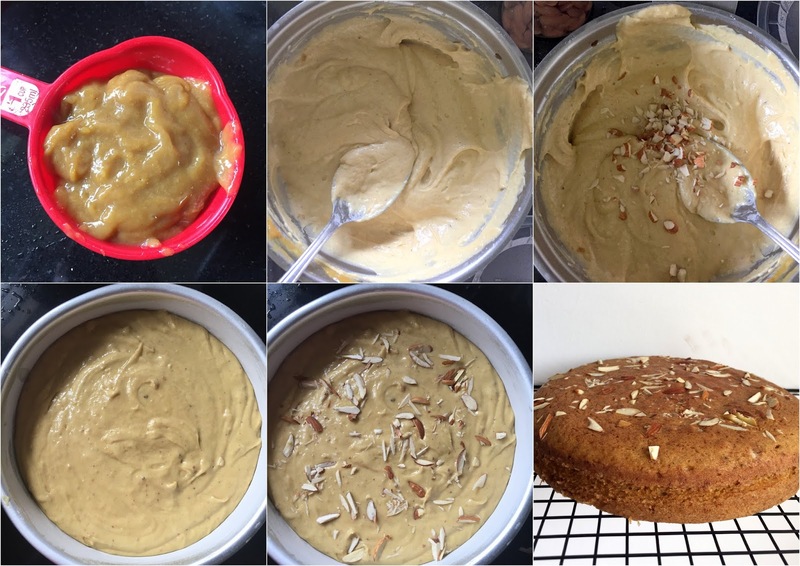 however my jackfruit pulp already had jaggery in it so I reduced the sugar to 3/4 cup and the cake was moderately sweet as the jackfruit itself has sugar in it. Add sugar as per your sweet tooth,taste the batter and this should be slightly more then only after baking the sugar is correct. * For getting 1 cup powdered sugar,its better to add 3/4 cup sugar crystals to powder. * I added the whole spices; 1/4 " piece cinnamon,2 cloves and 1/4 " piece dry ginger to powder along with sugar. If you have already the powders ready at hand then use that. Cheera(red spinach) is highly nutritious and iron rich veggie. Local markets in Kerala have this veggie always and this makes a very healthy stir fry. I love to just mix this stir fry with some steamed rice, tastes delicious. This is a very simple stir fry and the only time taken is to clean and chop the leaves. I had this red spinach in my small kitchen garden and so totally enjoyed this veg stir fry frequently. Do try it out if get some this fresh leaves. Chop off about 4" above the roots,if you get it with roots. That portion near the roots is hard stem and doesn't taste good in stir fry. Wash the remaining red spinach under running water 4-5 times ot till the water is clear. Drain water completely. Chop the leaves fine and add the sliced shallot,green chillies. Mix it with some turmeric powder. Heat oil in a pan and add mustard seeds.When it splutters,add curry leaves. Transfer the chopped spinach mix,toss well. Cover and cook for 3 minutes. Uncover the lid,add salt at this point and mix well. Add the coarsely ground coconut mixture. Add and cover the mix again for 5 minutes. Uncover the lid, add the ghee and mix well. Wait till the moisture is dried up, check salt and adjust accordingly. * Add salt only once the leaves are wilted as you may end up adding more salt once its chopped. The wilted leaves are reduced considerably. * Adding ghee is optional,adds a nice flavor to the stir fry(my mom's tip). * You can add 1/2 tsp chilli powder instead of green chilli too. Hair is an important aspect as far as a human being is considered. I don't know how many will agree to this but I strongly feel that the first thing a person notices as you look at him/her is their face and the hair that's part of face. Hair,as we all know can make you look younger for a male and enhances the beauty of a female as well. But these days, many are facing issues of hair fall due to many factors. The factors can be the lifestyle, the habits or hereditary or due to any illness or pollution. Everyone is busy with so many things that hair is usually ignored and becomes crucial only when the issue has reached its peak. About few months back,I got a mail requesting to post hair nourishing oil recipe and I was like then I should definitely post these hair nourishing oil recipes which have proved helpful to me. That's how I thought to share my homemade hair oil as a post. I make both these alternatively so that both help to keep the hair strength. I have 4-5 aloe vera plants at home and so making aloe hair oil was an easy task. Amla is coming up in season now and you can always dry and use later throughout year. I wouldn't say that having long hair shows the strength of the hair roots neither do I have long hair. But keeping your scalp healthy and nourishing the roots,moisturizing the hair with oil has been my priority these days. Make sure to oil your hair atleast once or twice a week which will solve or bring down many issues concerned with hair. I had not been taking care of my hair after school days and used to use all sorts of shampoos which left the hair brittle at one point of life. Pregnancy and post delivery went through another course of hair fall which seriously made me think what to do about my hair. After trying so many products,finally settled on trying out natural home remedies and it really worked. Being from Kerala, we keralites only apply coconut oil to hair. so my preparations are all based on coconut oil as the base. And experts claim coconut to be one of the best nourishing oil for hair too.I even started to prepare my own hair oil which really worked wonders on the hair. Though this is not a food recipe but as far as ladies are concerned this is a keeper and do bookmark it up to try. You can use fresh curry leaves too. But here I have used dried curry leaves. Keep fresh curry leaves in sun for 2-3 days. Use dry amla pieces to make oil. Cut and sun dry the amla pieces for 3-4 days till its crisp. Add the coconut oil,dry amla pices and curry leaves. Place the pan on low-medium flame and simmer. Then, let the amla pieces swell up well and in the meantime,the curry leaves turns blackish and the amla pieces starts to float on top.At this point,switch off flame and leave to cool. * If you don't have time to dry amla then just crush the amla(without seeds) in a mortar and pestle and add to the coconut oil. Add fresh curry leaves and then simmer it in oil till the amla pieces turn brownish black and the water content in the oil is considerably reduced. I( have tried this way too,works out fine. 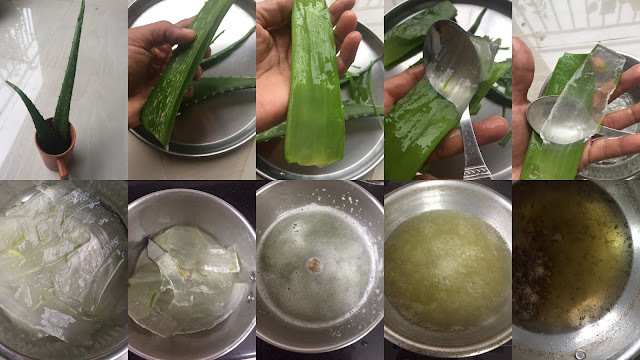 I used to three aloe vera leaf, wash under running water and then leave it in a glass standing to drain the yellow sap or aloe latex. This may be irritating to some skin types.I extracted the gel in a bowl and then put it in a blender. Run the mixer till its smooth and without lumps,it may take few times until everything looks crushed and liquid. Add in a kadai /heavy bottomed pan and add coconut oil. Bring to a boil and then simmer on low flame for 15-20 minutes. The popping sound in the oil stops and turns slightly yellowish brown in color( you may also see sediments). The oil shouldn't be put on high flame as the oil contains watery aloe gel which will splatter out and aloe vera gel shouldn't be boiled over on high heat. Switch off flame,leave to cool and strain the contents. Squeeze out any oil from the strained sediments too(I generally squeeze this out separately and use this immediately to finish off soon and leave the clear oil undisturbed). Transfer this to clean dry bottles and is ready for use. * I used coconut oil and aloe gel in the ratio 1: 1 but ideally 1:1/2(coconut oil) ratio should be used if using for severe hair loss. * There is no particular quantity of aloe gel needed, just remember the ratio and make the oil accordingly. * I usually add a pinch of jeera(cumin seeds) too in the amla hair oil. Chakka season is almost to an end this year and unfortunately couldn't munch much of this fruit except for three or four good ones. Some of the jackfruits are still getting mature and will be ready only in another two months. However,its a known fact that this fruit doesn't taste sweet once rain starts. And so I feel no much chances of getting good ripe ones anymore this year. 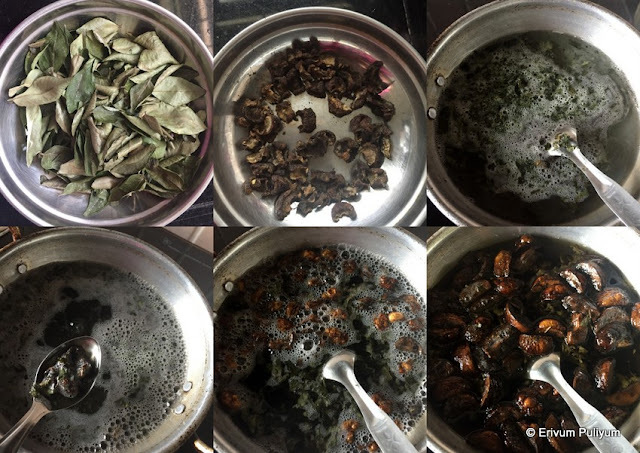 Last year we had plenty of jackfruit in both homes and so I tried lot of chakka recipes. This is definitely a keeper recipe and this is my trial and error version of my own jams. Came out really good but that jam has predominant flavors of chakka aka jackfruit. The color of the jam is similar to mango jam. And I made a big batch of this jam and I could send a batch to my sis and home too.However, in my next trial I would definitely go about adding a citrus touch to this sweet jam. Oranges may pair well with this jam and I would prefer adding them to this sweet jam to break the sweet flavor slightly. Otherwise this is a perfect jam for all and you need only very less sugar as chakka(jackfruit) itself is very sweet. Do try out if you still get hold of good jackfruit and preserve all the year. Clean and deseed the jackfruit seeds. Cut the jackfruit in small pieces and cook the jackfruit in a cooker. Add half cup water and cook for three whistles. Cool the cooked jackfruit and puree the jackfruit in a blender without adding any water. Heat a thick bottomed pan and add the sugar with 1/4 cup water. Bring this to *one string consistency and then lower the flame. Now, add the pureed jackfruit and mix well. Keep the flame low and keep the pan covered as the liquid splatters all around if you keep the flame on high. In between uncover the lid and give a quick stir as there are chances of the mixture getting struck to the bottom of the pan and get burnt. 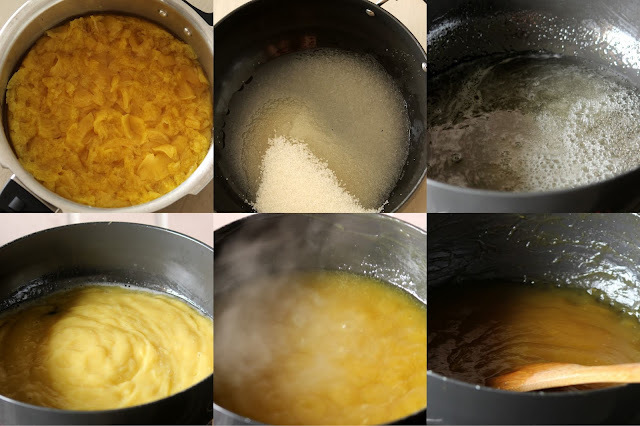 After about 30 minutes of stir in between, the mixture is reduced considerably and splashes are reduced as the water content is reduced. Now keep stirring continously using a long handle spoon for another 15 minutes. Add the lemon juice at this point or citric acid if using. The jam can be tested by placing a dropful on a plate and wait to cool. When this gets cooled down,tilt the plate to see if the drop of jam rolls down. If it stays there then jam is ready. Switch off flame and leave to cool completely. Store in air tight glass bottles in refrigerator. Remove as much needed each time,bring to room temperature and use. * Use long handle wooden spoon to mix the jam and stir. There is enough heat transferred to the hands and jam making is a long process so constant stirring needs a lighter spoon or else you may land up with sore hands. * One string conisistency or oru nool pakam is when the sugar syrup consistency is thick and when you take a drop in between your thumb and index finger,then a string like consistency is formed. * If you are making a small batch then adjust the ratio of sugar and jackfruit accordingly. I took in the ratio 2: 1(jackfruit : sugar). * Also depending on the sweetness of jackfruit,add more sugar if needed. The ones I used tasted like honey so had to use less sugar. For more homemade jams,click this link here.